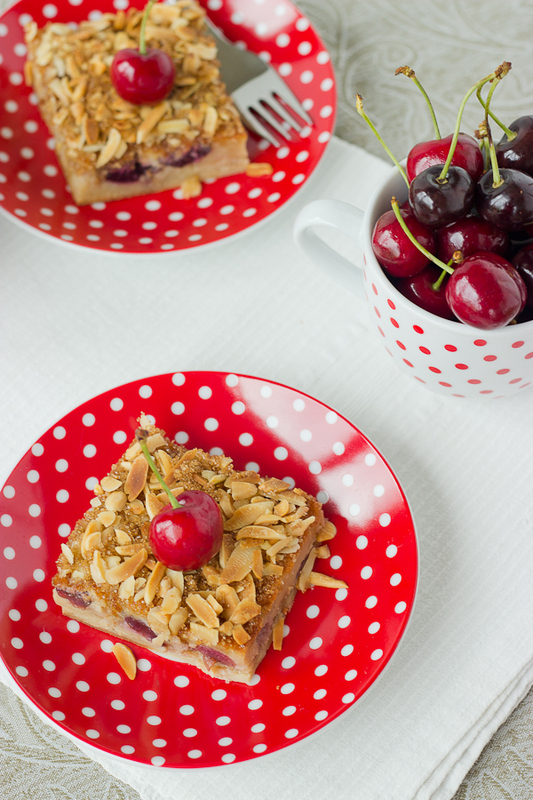 Clafoutis is the French tribute to cherries. It is a fusion of a custard and cake and is one of the best spring desserts. 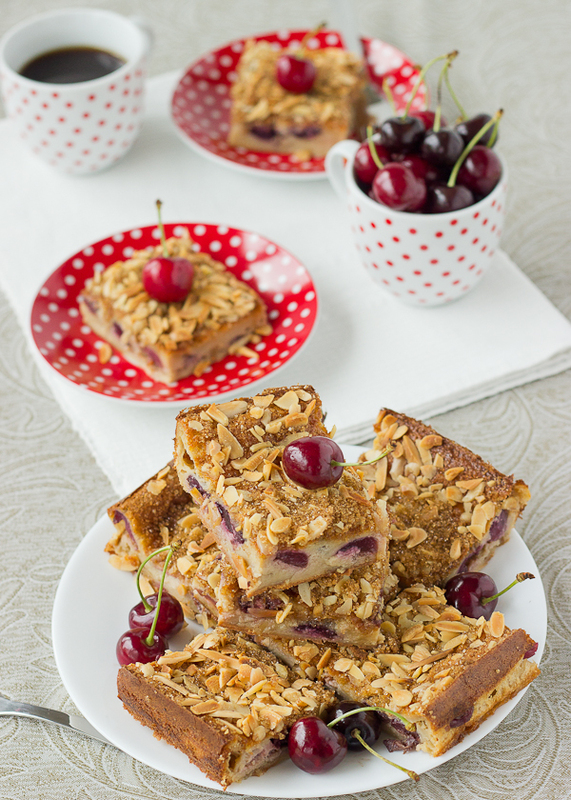 The texture is very light, yet creamy and the juicy cherries compliment beautifully the sweetness of the batter. I had this Clafoutis on my mind for quite some time now. I made it in a square form, and cut it in bars so it can be easily accessible. This way you can devour it anytime, anywhere, you don’t even need a fork. But it can also be served with tea or coffee because it is quite fancy. 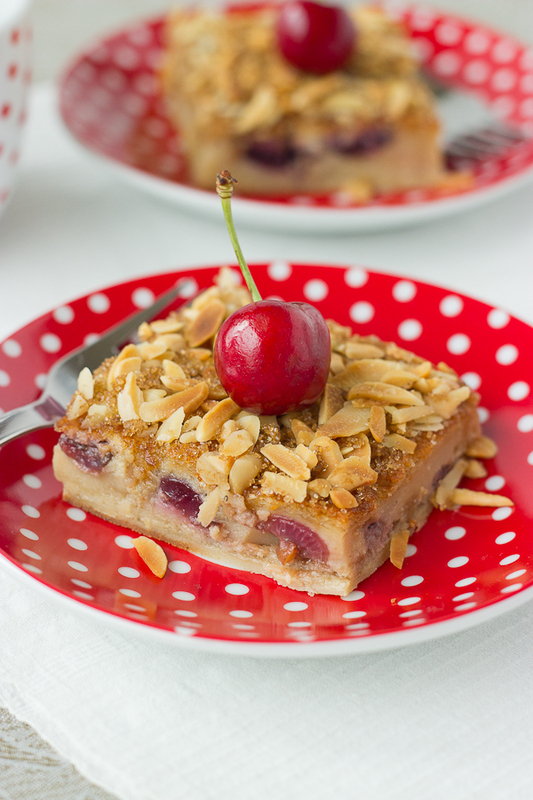 The almonds are really a great match to the creaminess of the Clafoutis, they provide another textural level and the combination of cherry and almonds is dreamy. The original recipe is made with whole cherries, without removing the pits, to add more fragrance and flavor to the Clafoutis. I don’t like pits in my desserts and honestly, I find it good enough like this, but if you decide, you can try it the original way. No spring menu is completed without the presence of a Cherry Clafoutis so make sure you give it a try! Recipe adapted from Chef Nini. The French tribute to cherries! 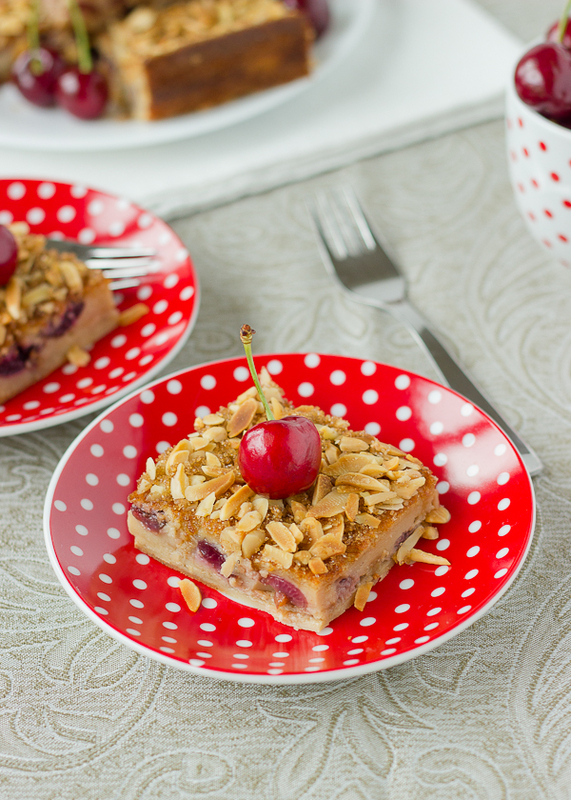 A beautiful spring dessert with cherries. 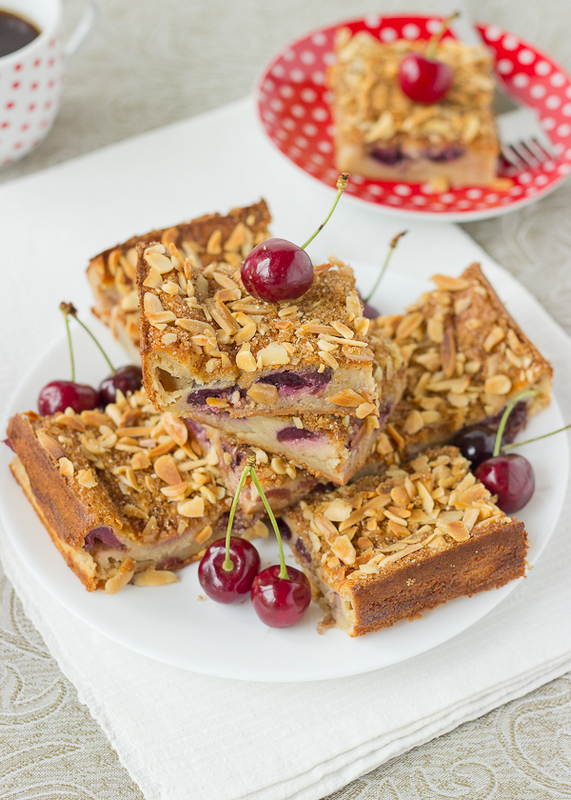 A composition between flan and cake with crunchy almonds on top. In a bowl mix the cherries with the brandy and let them macerate for 1 hour. Butter and flour the bottom and the sides of a 26 cm/10 inch square pan (I used a spring-form pan to release the baked Clafoutis easier). Preheat the oven to 180°C/360° F.
In a bowl place the eggs and the sugar and beat with the whisk attachment of your mixer until thick and the mixture flaws forming a ribbon when you pick up the batters (5 minutes). Gently fold in the flour a few tablespoons at a time using a spatula. Add the milk, cream and vanilla extract and mix with the spatula. Pour approximately half of the mixture into the pan and bake for 5-7 minutes until a thin crust forms. 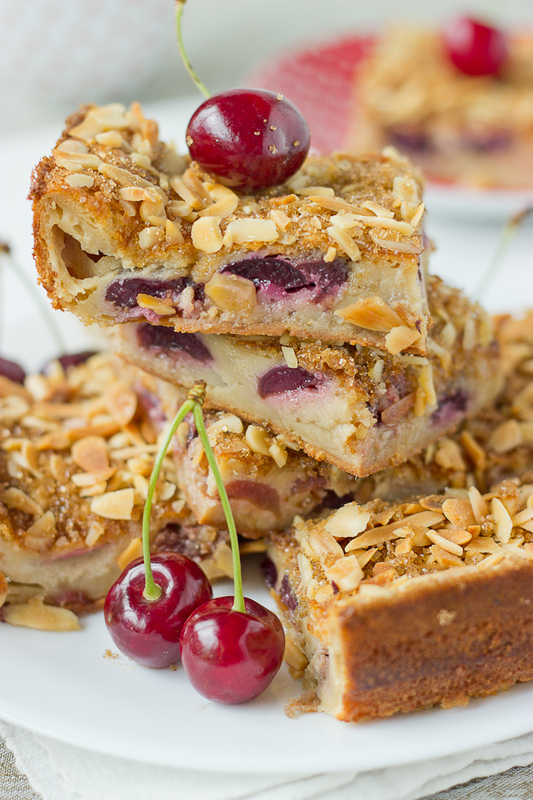 Remove the Clafoutis from the oven and arrange the cherries over the batter. This way your cherries won’t sink to the bottom. Pour the remaining batter on top of the cherries and bake 20 minutes. 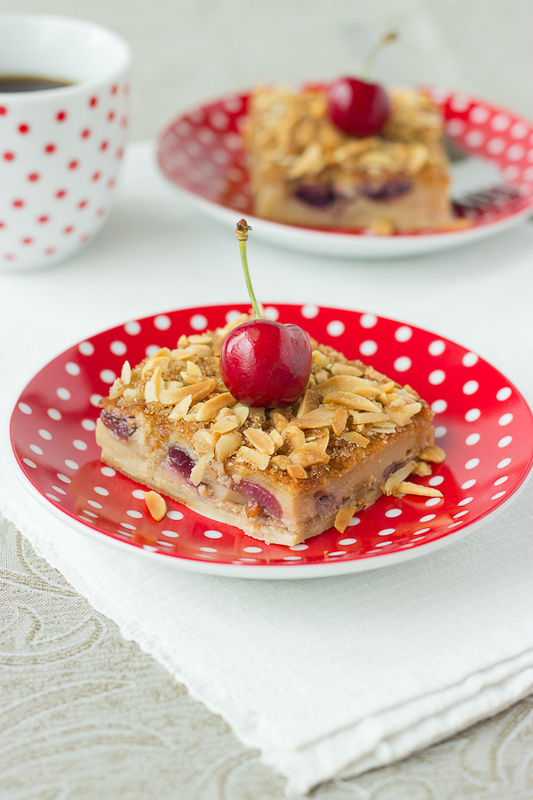 Take the Clafoutis out of the oven and sprinkle the almonds and sugar on top. Return to the oven and bake for another 25-30 minutes until a toothpick inserted into the center comes out clean. Cut and serve at room temperature. Thank you! You should give it a try!